SOUTH KOREA: The leaders of the two Koreas will hold a summit in Pyongyang in September, Seoul said Thursday, as the North’s leader Kim Jong Un renewed his commitment to the denuclearisation of the flashpoint peninsula. The announcement of the September 18-20 summit -- the third between Kim and South Korean President Moon Jae-in this year -- comes as US efforts to dismantle the North’s nuclear arsenal have stalled. The two leaders will meet in the North Korean capital to discuss “practical measures to denuclearise” the Korean peninsula, South Korean National Security Advisor Chung Eui-yong told reporters. Kim made it clear that his “trust in Trump remains unchanged” despite the difficulties, Chung said, and expressed his “intention to work closely with the US” and “achieve the denuclearisation of the Korean peninsula in the first official term of President Trump.” But the North Korean leader also expressed a “sense of frustration” with the international community for not appreciating what he called Pyongyang’s “very significant and meaningful” steps, Chung said. 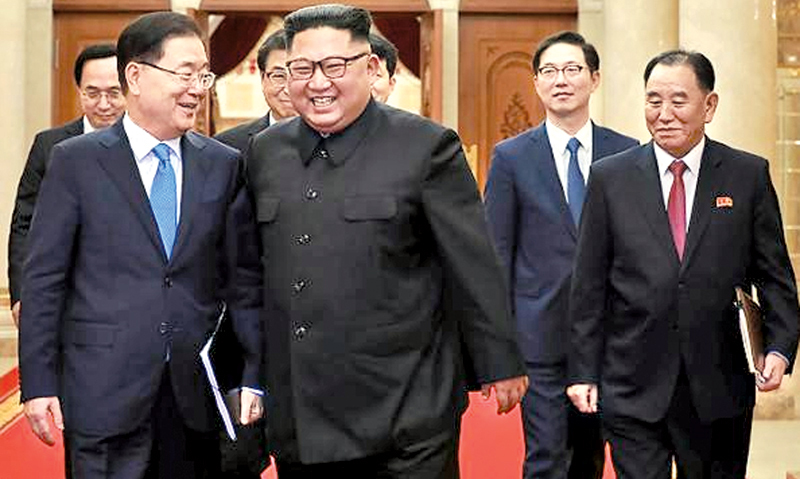 “Chairman Kim asked us to convey the message to the US that the US (should) help create situations where he would feel his decision to denuclearise was a right move”, Chung added.